Meaghan Clark Memorial Run – November 14, 2015 | NC Race Timing and Running Events | Go Time! Participants may choose to run or walk the 5K timed. The Fun Run is not timed. See course descriptions below. This is a non-profit fundraising event in support of the Meaghan Clark Scholarship Fund and the Topsail High School Music Department. 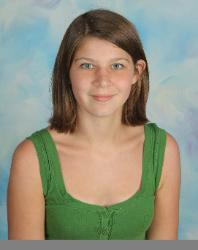 It is in honor of Meaghan Clark who was just 16 years old when she fell ill from the seasonal flu. Due to complications, she left this earth on November 6, 2009. Meaghan was a dedicated student, musician and daughter. 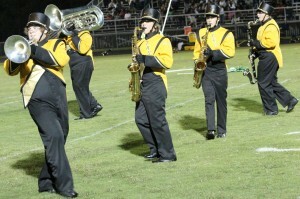 The Meaghan Clark Scholarship Fund’s mission is to provide scholarships and encourage future musicians/scholars of Topsail High School to pursue their dreams. The Meaghan Clark Memorial Scholarship 5K Road Race and 1 Mile Fun Run is a fun event geared toward runners of all ages and experience. Participation and staffing by Topsail School District Students provides an uplifting, enjoyable atmosphere in Meaghan Clark’s honor. This event helps raise money for the Meaghan Clark Memorial Scholarship Fund and the Topsail High School Music Department. The 5K is a 3.1 mile looped course with one switch back. Participants will begin on the Topsail High School track, proceed around the adjacent parking lot, around the school, and out onto Saint John’s Church Rd. Participants will turn around at the 1.5 mile mark which is at the end of Saint John’s Church Rd. They will then run back past the high school and parking lot, loop around the Middle School, and head back into the track where they will finish. The 1 Mile Run Run is a looped course. 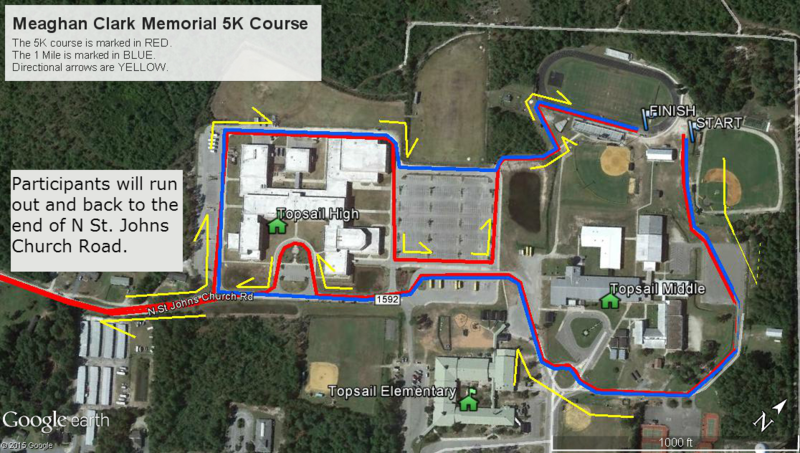 Participants will begin on the Topsail High School track, proceed around the adjacent parking lot, around both the middle and high school, before heading back into the track where they will finish. Shirt sizes are only guaranteed to those who register for the shirts by November 6, 2015. Extra shirts may be purchased for $5.00. Shirts were designed by one of Meaghan’s closest friends Emily Woodrich. Emily is one of the first Meaghan Clark Memorial Scholarship award winners. She graduated from App. State University with a degree in graphic design. The design was a gift provided to us all in Meaghan’s memory. 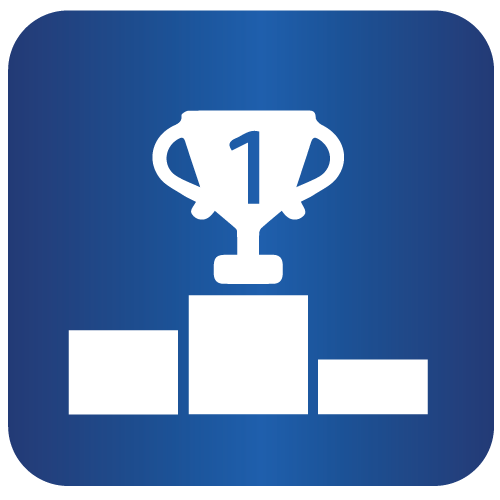 Under 12 in Fun Run will get a certificate. Pre-registered participants may pick up their race numbers and shirts at packet pick up listed above. For those who wish to register in person, you may do so at any Packet Pick-Up listed above. You can still register in person at the track Saturday morning. Participants may park Topsail High School. The Meaghan Clark Scholarship Foundation will award one (or multiple) student(s) who demonstrates the dedication to the music program of THS along with the moral force of character and leadership. The recipient(s) of this scholarship will be a student who embodies dedication, integrity, and who seeks to further their education. Selections are based on dedication to the THS Music programs, merit and how powerfully the applicant exemplifies these qualities in their essay. Please visit their official website for more information. In honor of Meaghan Clark, who passed at a young age from flu complications, the Pender County Health Department will be offering a Flu Shot Clinic at this race. This will be available to participants and non-participants.